The distinction between the physical and the moral only became a practical concept in the medicine of minds when the problematics of madness were displaced towards the interrogation of a responsible subject. The purely moral space that was then defined measures exactly the psychological interiority where modern men seek both their depth and their truth. The perspective on pain that we could relate to the thaumaturgical capacity of art is that of Lévi-Strauss, and the transition necessary to do so requires identifying the artist with the shaman. “The cure consists in making explicit a situation originally existing on an emotional level and in rendering acceptable to the mind pains which the body refuses to tolerate”, the author explains in his Structural Anthropology. What, then, could be more apt for the very art that in our era presents itself to the social body as its symptom and at the same time as its therapy, a sort of “medication” that activates the defences of the community and of culture, through barely perceptible homoeopathic infusions of the very substances that are poisoning us? Because as the anthropologist showed us in his study, within the framework of the indigenous understanding of the world the cure practised by the shaman is always underpinned by a spiritualised conception of pain, on the premise, also fully accepted, that “the relationship between the monster and the disease is internal”; in other words, that it is part of the patient’s spirit. Thus Lidó Rico’s work will enable us here to auscultate, analyse, or perhaps just suspect or glimpse the general ailments of the spirit of the age, through its offering to the world of art. I have commented elsewhere on that distinctive, almost performative undercurrent covertly present in his work, completely invisible to any viewer standing in front of his finished pieces. There is a total immersion in the material — the materials — that shape the artwork, whose form is acquired by contact with a suffering, subjugated body, in forced postures humiliating to public dignity, defiled, soiled and on the verge of suffocation: a dirty body, therefore, which contaminates the original material. The paralysed cry, the grimaces of disgust or pain, crystallise in the mass only because the artist’s body has emphasised it to the point of petrifying its simulated suffering, wallowing in it. It is a fixed image of the uncontrollable. We are dealing, of course, with a radical version of the theatrical impression that affects the sensibility of the audience in front of the stage, who are indelibly changed inwardly after projecting themselves onto the emotions and experiences of the actors performing before them and for them. Classical theory reminds us that this cathartic function of simulation in the presence of others initially pushes the audience to an unprecedented limit of involvement in the problem in question, tragedy, but also that they will then inevitably be returned to “reality”, though now affected by the spectacle they have witnessed and have somehow suffered in their own flesh. That this process of taking on the pain of others (re)positions us is by now a long-standing topos; but that the purification provided by art puts us a step ahead of or a step behind our previous thresholds of tolerance of the world’s evils is something that would be difficult to discern clearly nowadays. In this respect Lidó Rico adheres to procedures that are in principle diametrically opposed to the anaesthetic effect of the media, with their constant live broadcasting of horror. In contrast to the relentless, endlessly perpetuated demonic saturation of disparity, this artist piles on the pressure with precision and shows his strength in spaces, gestures and moments of indescribable intensity, specific and terrifying. In this sense, many of his pieces are unbearable (holding nothing back, exteriorising everything): truly intolerable. Art, once again, is uncontrollable, while boredom, as Jünger said, “is simply the dissolution of pain in time”. In contrast, Lidó Rico shows us not so much the punctum of suffering, the core or nodal point of the emotional, existential dénouement of a suffering body — though he does that too — as “a language in which states, unformulated and otherwise impossible to formulate, may be immediately expressed”, to quote Lévi-Strauss again. In making the transition to that verbal expression, offering formulas through which to come to terms with the enduring nature of extreme personal experiences in a way that is intelligible to the community, to the viewer, to culture, this artist performs a dual function, acting at once as a bodily physician and a psychological therapist. Even in the early days — I am referring to the mid-1990s — when his work had not yet adopted such a mortifying formulation of our desolation, Francisco Jarauta sensed “the gaze that probes the abyss and recognises no safe place, even in dreams”, using this phrase to explain the artist’s emphasis at that time on “a fragility within the work and its representation”, which he has somehow never abandoned. In those same years, despite putting forward a very different interpretation, Francisco Javier San Martín elaborated on that relationship between the material components and his dreamlike vision, when he recognised that “Lidó Rico is not, of course, a follower of Duchamp, although the Surrealist element […] is a key ingredient in his work. On the other hand, there is a very specific type of relationship with materiality and craftsmanship in these pieces: his work is not sanitised, but neither are the traces of manipulation prominent”. And indeed, it is true that the concrete presence of the body lies not in its trace, but in its hollow form… This is probably why the viewer’s consciousness is struck by that unsettling strangeness so typical of the surrealistic experience and of dreamlike states, as in semi-consciousness itself, in which life is both there and not there at the same time. It is a disturbing quality amply exploited in the aesthetics of uncertainty: things show us a recognisable face (in this case it even has a name), but in its features we glimpse that void, the negation of identity, where the familiar voices are no longer ours… Because aspiring to see oneself exactly as one is, without the inversion imposed by reflection in the mirror, can only be understood as a first alarming symptom of madness. But even beyond the face, the literality Lidó Rico needs in order to carry out his work is sometimes frightening. 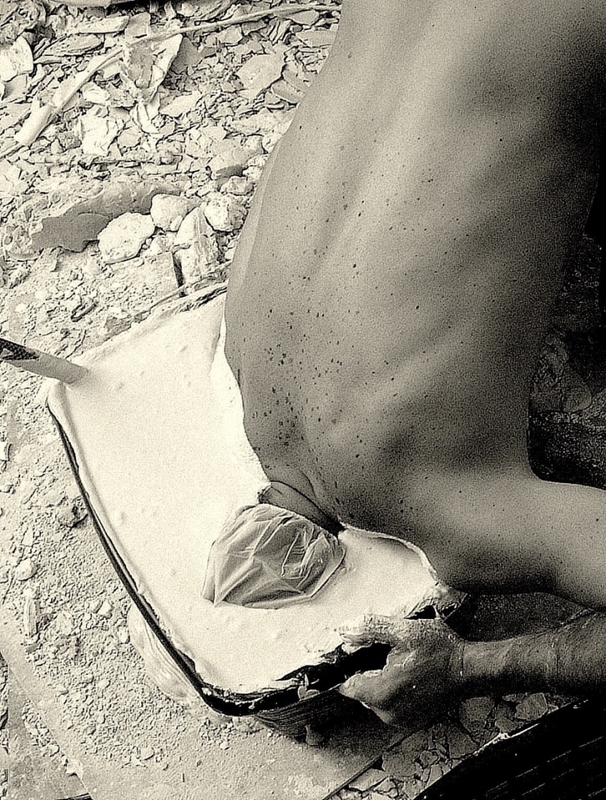 “Diving in plaster is liberating for me”, he confesses, “because it swallows up the transience of the body […] I have always thought that the gruelling, torturous nature of the process is implicitly present in the pieces themselves: uncertainty, violation, ignorance, anger, passion, satire, distress, madness… the whole pack of commotions is concentrated and mutated into resin, finally reaching the conclusion that humanity begins where reason ends.” And beyond this? Beyond that familiar face, there is still inner life… literally. As when he moved heaven and earth to be able to work with real human brains, with no simulation or technological reconstruction from a meticulous scan; no substitutes or allegories or messing about: Lidó Rico needed to have the weight and texture of the organ in his hands as an actual, specific corpus certum, an indispensable requirement for someone whose iconographic repertoire unfolds from the nervous activity contained in its circumvolutions. In any case, the means employed to articulate an unequivocal image of the private or collective anguish in which people of our time are drowning seem to be just the first stage of a therapy that forces us to witness the inner drama of a body — individual or social, I repeat — whose relationship with its surroundings is one of grieving. Even in those works of his in which playful elements, or cultural references (as for example in the series quoting great names from the history of art), seem to be to the fore, the image of humanity that always occupies centre stage “burns you with his pain”, as Baudelaire put it in his famous poem Alchemy of Suffering (“L’un t’éclaire avec son ardeur”), although there are some translations that opt to render the verb as “illuminate”. And Lidó Rico does indeed work on the path of the flowers of evil, a luminous, burning path that consumes those who enter deeply into it. As he himself does by diving in plaster. Es la perspectiva de Lévi-Strauss sobre el dolor la que podríamos emparentar con la capacidad taumatúrgica del arte, para lo cual el tránsito necesario impone la identificación del artista con el chamán. “La cura consistiría, pues, en volver pensable una situación dada al comienzo en términos afectivos y hacer aceptables para el espíritu los dolores, que el cuerpo se rehúsa a tolerar”, explica el autor en su Antropología General. ¿Qué mejor encaje, entonces, para ese mismo arte que, en nuestro tiempo, se presenta ante el cuerpo social como su síntoma y al mismo tiempo como su terapia; como una suerte de fármaco que activa las defensas de la comunidad y de la cultura, por medio de intervenciones homeopáticas, apenas perceptibles, de las mismas sustancias que nos envenenan? Porque, como nos demuestra en su estudio el antropólogo, en el marco de la concepción indígena del universo, la cura puesta en práctica por el chamán se asienta siempre sobre los cimientos de una concepción espiritualizada del dolor, bajo el supuesto también completamente aceptado de que “la relación entre monstruo y enfermedad es interior”; es decir: que forma parte del espíritu del paciente. Así, la obra de Lidó Rico nos va a permitir aquí auscultar, analizar, o quizá sólo sospechar y entrever los padecimientos generales del espíritu de la época, por medio de su ofrecimiento al mundo del arte. En algún otro lugar he comentado ese peculiar trasfondo casi performático que su trabajo conlleva de manera solapada, invisible por completo para cualquier espectador que se plante delante de sus piezas ya terminadas. La inmersión literal en la materia –en los materiales- que configura la obra de arte, cuya forma se adquiere por contacto con un cuerpo sufriente y doblegado, en posturas forzadas, humillantes para la dignidad pública, mancillado, ensuciado y al borde de la asfixia. Cuerpo sucio, pues, que contamina la materia primigenia. La parálisis del grito, las muecas de repugnancia o dolor, cristalizan en la masa sólo porque el cuerpo del artista ha insistido en ella hasta petrificar su padecimiento fingido, enfangándose en ella. Imagen fija de lo inmanejable. Asistimos, claro está, a una versión radical de la impresión teatral que afecta a la sensibilidad del espectador, quien frente al escenario queda indeleblemente modificado en su interior tras proyectarse en las emociones y vivencias de los actores que frente a él y para él actúan. La teoría clásica nos recuerda cómo semejante función catártica de la simulación frente a los otros, en un primer momento empuja al público a un límite inédito de su implicación con el problema en cuestión –la tragedia-; pero también, que el espectador, en un segundo momento, será devuelto a “la realidad” inevitablemente, aunque ya afectado por el espectáculo al cual ha asistido y que de alguna manera ha padecido en sus propias carnes. Que semejante asunción del dolor ajeno nos (re)posiciona, es un topos ya antiguo; pero que la purificación que proporciona el arte nos coloca un paso más adelante o uno más atrás de nuestros umbrales previos de tolerancia a los males del mundo, es algo que hoy sería difícil de discernir con claridad. Lidó Rico se adhiere en este sentido a unos protocolos en principio diametralmente opuestos al efecto anestésico de los media, con su incesante retrasmisión en directo del horror. Frente a la saturación demoniaca, incesante, encadenada sin fin de lo dispar, el artista aprieta con precisión y se hace fuerte en espacios, gestos y momentos de indecible ardor. Concretos y escalofriantes. En este sentido, muchas de sus piezas son insufribles (nada aguantan, todo lo exteriorizan): verdaderamente intolerables. El arte, una vez más, resulta intratable, mientras que el aburrimiento, como decía Jünger, “no es otra cosa que la disolución del dolor en el tiempo”. Frente a ello, Lidó Rico nos indica no tanto el punctum del padecimiento, el núcleo o punto nodal del desenlace emocional, existencial de un cuerpo sufriente -aunque también-, cuanto “un lenguaje en el cual se pueden expresar inmediatamente estados informulados o informulables de otro modo”, siguiendo de nuevo a Lévi-Strauss. En el paso a esa expresión verbal, donde se dan fórmulas para asumir de manera inteligible para la comunidad, para el espectador, para la cultura, lo inmarcesible de las experiencias límites personales, nuestro protagonista se comporta a la vez como médico del cuerpo y terapeuta psicológico, en una doble función. Aun en los comienzos -estamos hablando de mediados de los noventa-, cuando su trabajo todavía no se había decantado por una formulación tan mortificante de nuestra desolación, Francisco Jarauta intuía “la mirada que tienta el abismo y que no reconoce, ni siquiera en el sueño, un lugar seguro”, explicando con ello en la insistencia del artista entonces por “una fragilidad interna a la obra y a su representación”, que de alguna manera nunca ha abandonado. En esos mismo años, y aunque proponiendo una interpretación muy diferente, Francisco Javier San Martín, abundaba sobre esa relación entre los componentes materiales y su dimensión onírica, cuando reconoce que, “por supuesto, Lidó Rico no es un adepto duchampiano, aunque la componente surrealista […] resulta un ingrediente clave en su obra. Por otra parte, en estas piezas hay un tipo de relación muy específica con el material y la manualidad: sin constituir un trabajo aséptico, en ellas tampoco predominan las huellas de la manipulación.” Y es que, en efecto, la presencia concreta del cuerpo no está en su huella, sino en su vaciado… De ahí probablemente que se imponga a la conciencia del espectador esa inquietante extrañeza tan propia de la experiencia surrealizante y de los estados oníricos, como en el propio duermevela, en cuyo seno la vida está y no está, al mismo tiempo. Es una cualidad perturbadora largamente explotada por la estética de la incertidumbre: las cosas nos muestran una cara reconocible –en este caso tiene incluso nombre y apellidos-, pero en sus rasgos entrevemos ese vacío, la negación de la identidad, donde las voces familiares ya no son nuestras… Porque aspirar a verse uno mismo tal cual es, sin la inversión que prescribe el reflejo en el espejo, no puede ser entendido sino como un primer y alarmante síntoma de la locura. Pero incluso más allá del rostro, la literalidad que le es necesaria a Lidó Rico para desarrollar su trabajo resulta por momentos escalofriante. “Mis buceos en escayola –confiesa el artista- suponen una liberación porque degluten la fugacidad del cuerpo […] siempre he pensado que la crudeza y tortura de su proceso, queda implícito en las propias piezas, incertidumbre, atropello, ignorancia, cólera, pasión, sátira, turbación, demencia… toda esa jauría de aspavientos se concentra y muda en resinas, para obtener al final la conclusión de que el hombre empieza donde acaba la razón.” ¿Y más allá? Más allá de esa cara conocida, todavía queda la vida interior… literalmente. Como cuando el artista removió Roma con Santiago hasta poder trabajar con cerebros humanos reales, nada de simulacros ni de reconstrucción tecnológicas tras un minucioso escaneado; nada de sustitutivos, ni de alegorías, ni zarandajas: Lidó Rico necesitaba tener entre sus manos el peso y la textura del órgano en cuanto cuerpo cierto, como una exigencia inexcusable para alguien cuyo repertorio iconográfico se despliega de la actividad nerviosa alojada en sus circunvoluciones. En cualquier caso, los medios empleados para articular una imagen rotunda de las angustias privadas o colectivas en que vive ahogado el hombre de nuestro tiempo, parecen sólo el comienzo de una terapia donde se nos obliga a asistir al drama interno de un cuerpo –individual o social, insisto- que se relaciona con lo que le rodea en clave de duelo. Hasta en esas obras suyas donde parece que se anteponen los aspectos lúdicos, o los culturalistas (como por ejemplo en la serie de citas a los grandes nombres de la Historia del Arte), la imagen del hombre que ocupa siempre el centro de la escena “te abrasa con su dolor”, como diría Baudelaire en su célebre poema, Alquimia del dolor (“L’un t’éclaire avec son ardeur”). Aunque hay algunas traducciones que optan volcar el verbo por “alumbrar”. Y sí, en efecto, Lidó Rico, trabaja en la senda de las flores del mal, camino luminoso y ardiente que calcina al que se adentra en él en profundidad. Como él mismo en sus buceos de escayola.